In advance of a storm expected to hit Santa Barbara County Thursday night, officials ordered mandatory evacuations for locations below the Thomas, Whittier and Sherpa fire burn areas. Residents have been ordered to leave those areas by nightfall. 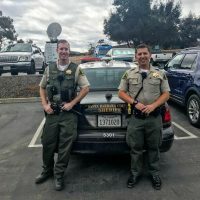 At 12 p.m. Thursday, Santa Barbara County Sheriff’s deputies began going door-to-door notifying residents. However, Sheriff Bill Brown said deputies will not be able to knock on every door in the affected areas. Brown said the incoming storm is not expected to be as powerful as the deadly Jan. 9 storm, but there is still a risk of flash flooding and mud and debris flows. Brown instructed residents to inform neighbors, family and friends about the evacuation orders and to not wait to leave. He also said evacuations need to be part of a “new normal” for residents of southern Santa Barbara County. The incoming storm is currently traveling down the California coast. It is expected to hit Santa Barbara County hardest between 2 a.m. and 8 a.m.
An evacuation center is now open at the Earl Warren Showgrounds. Residents can stay current on evacuation information by texting their zip code to 888-777 and visiting ready.sbc.org. In January, many residents ignored the evacuation warnings in advance of the storm that uprooted much of Montecito and other areas affected by the Thomas Fire. At least 21 people died in the mudslides that ensued.